Winner of Group A, Avatea will face off with Group B runner up Nikao in the girls division. Avarua, winners of Group B will not leave anything to chance as they play Arorangi Group A’s runner up. Titikaveka battled it out with Arorangi on Monday 17th March for an intense game that went down to the wire, placing them third in Group A. Titikaveka will play 4th place Group B Te Uki Ou. Last year’s Girl’s division winner’s Nukutere in Group B will play 4th place Papaaroa. In the boys division winner of Group A, Arorangi will face off with Nikao runner up in Group B. Winners of Group B Avarua will play Avatea, Nukutere will play Te Uki Ou and Titikaveka will play Papaaroa. It will be an exciting semi’s not to be missed. Last week’s Round three showed innovation and rhythm by the schools, as teams showed great control of the ball, showcasing more football Swagger in dribbling, kicking, shooting and passing. The schools showed that playing soccer together, working together and competing in a friendly way can be inspiring with valuable opportunities and life skills to nurture the potential future strong soccer representatives of the Cook Islands. 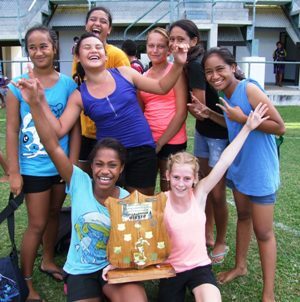 Mama Maura Katuke from Arorangi School said “the school enjoyed playing and that they had so much fun.” The schools improvement could be heard as the crowd of supporters cheered them on. Get into the Football Swagger and come and support the schools in the Semi Rounds today and Play Football in 2014.